Virus Locked In Siberian Ice For 30,000 Years Is Revived In Lab : The Two-Way A team of scientists says it has reawakened an ancient pathogen. It's not dangerous to humans, but they warn that climate change could free potentially deadly organisms locked in permafrost. This electron microscope image provided by researchers shows a section of a Pithovirus particle, dark outline, inside an infected Acanthamoeba castellanii cell. Scientists at a laboratory in France have thawed out and revived an ancient virus found in the Siberian permafrost, making it infectious again for the first time in 30,000 years. 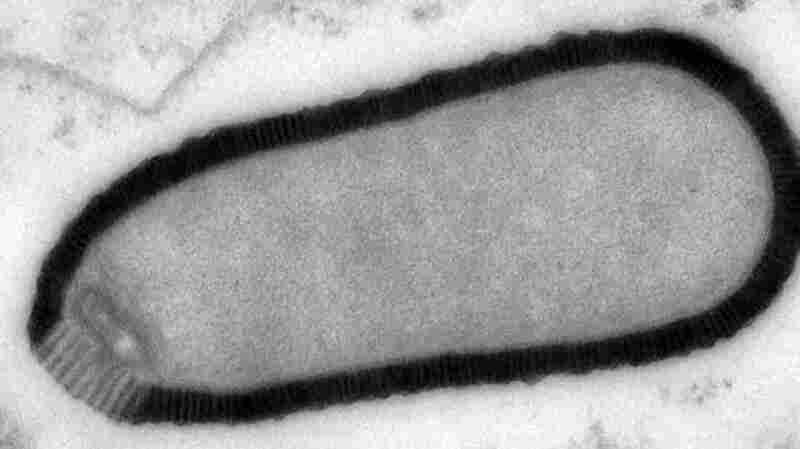 The giant virus known as Pithovirus sibericum was discovered about 100 feet deep in coastal tundra. The pathogen infects tiny amoebas — simple, one-celled organisms. It isn't dangerous to humans, but its reanimation raises questions about what else might be lurking under the ice, says the French and Russian team that brought it back to life. Their work is in the latest issue of Proceedings of the National Academy of Sciences, or PNAS. "The revival of such an ancestral amoeba-infecting virus ... suggests that the thawing of permafrost either from global warming or industrial exploitation of circumpolar regions might not be exempt from future threats to human or animal health," the scientists write. Jean-Michel Claverie, a study author from the National Center for Scientific Research in Aix-Marseille in France, tells the BBC that exposing such ice layers and possible pathogens contained within is "a recipe for disaster." "If you start having industrial explorations, people will start to move around the deep permafrost layers," Claverie says. "Through mining and drilling, those old layers will be penetrated and this is where the danger is coming from." He adds that ancient strains of the smallpox virus, which was declared eradicated 30 years ago, could pose a risk. "If it is true that these viruses survive in the same way those amoeba viruses survive, then smallpox is not eradicated from the planet — only [from] the surface," Claverie says. "By going deeper, we may reactivate the possibility that smallpox could become again a disease of humans in modern times." The newly discovered virus belongs to a class of giants discovered just a decade ago. Because of its size (1.5 microns in length), it can be seen under a microscope, unlike other types of viruses. (A micron, also known as a micrometer, is one millionth of a meter; a human hair measures 40 to 50 microns in width). This is the same team, as NPR's Geoff Brumfiel reported last year, that discovered Pandoravirus, which is about 1 micron in length and in the same class of giant viruses as Pithovirus. "A typical virus is a tiny sack of genetic material that injects itself into a much larger cell and uses it to make more viruses." "Giant viruses also dwarf other viruses in terms of genetic complexity. The newly discovered Pithovirus contains 500 genes, and the aforementioned Pandoravirus can contain up to 2,500." "Amazingly, even after more than 30,000 years embedded in ancient permafrost, when Claverie and Abergel exposed amoebas in their lab to the virus, they found that the virus was still active and quickly infected the host cell. 'We use amoeba on purpose as a safe bait for capturing viruses. We then immediately verify that they are not able to infect animal/human cells,' stressed the researchers."